Fine wine often improves with time, but aging in the wrong conditions can irreversibly compromise your collection and investment. At 55° we understand how wine evolves in the bottle. Built in 1889 as a brandy storage warehouse, our facility’s 20-inch thick walls and insulated interior walls are supplemented by refrigeration for an ideal cellar environment. 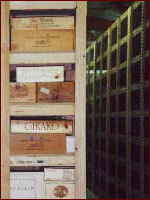 The sturdy stone building also protects wine from potentially harmful natural light and vibration. The key to proper wine storage is providing an ideal and unchanging environment, one that allows wine to age slowly and gracefully. Climate: It is generally agreed that temperatures from 55° to 59° allow wines to develop at an optimum rate. Higher temperatures will age wine prematurely, devaluing and shortening a wine's lifespan. 55°’s cellar features thermostat-controlled refrigeration which provides excellent air circulation (important for controlling mildew) and ensures even temperature distribution throughout. Light: Light can prematurely age wine, even when the exposure is very brief. Our stone cellar prevents natural light penetration; we use low intensity lighting throughout to provide the greatest degree of protection. Vibration: Vibration can affect the equilibrium and development of wine. 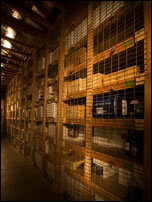 Our solid stone walls and concrete flooring minimize movement within the cellar. Security: For the utmost protection, our facility is equipped with state-of-the-art infrared motion detectors and security alarm systems. Each locker is secured with an individual padlock and key, and all conditions are monitored 24 hours a day.